Zenith Nutrition Biotin plays a key-role in the body and is an important nutrient for the growth and supports the health of the skin, thick shiny hair and strong nails as well as of the nerves and digestive tract. 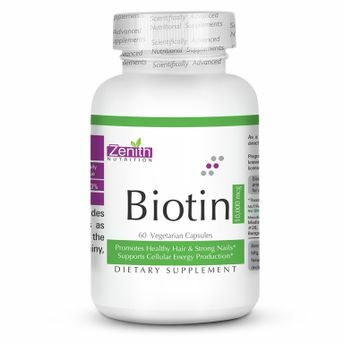 This supplement is enriched with Biotin, a B vitamin, also known as vitamin H or Vitamin B7. It is essential for your metabolic processes including the metabolism of fats and amino acids, production of fatty acids, and cell growth. This vitamin processes nearly every type of food that you ingest, including carbohydrates, proteins and fats. When biotin levels are at the proper levels in your body, the food that you take in will be processed quickly. Promotes healthy skin, hair and strong nails. Helps maintaining healthy nerves, digestive tract. Alternatively, you can also find many more products from the Zenith Nutrition Biotin 10000 Mcg Capsules range.